Mercury: Computer Photomosaic of the Beethoven Quadrangle, H-7	The Beethoven Quadrangle, named for the 19th century classical German composer, lies in Mercury's Equatorial Mercator located between longitude 740 to 1440. 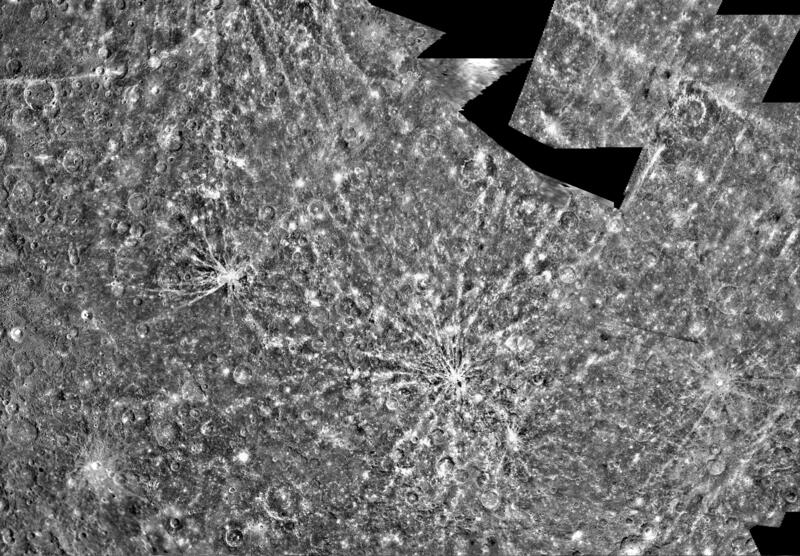 The Mariner 10 spacecraft imaged the region during its initial flyby of the planet. 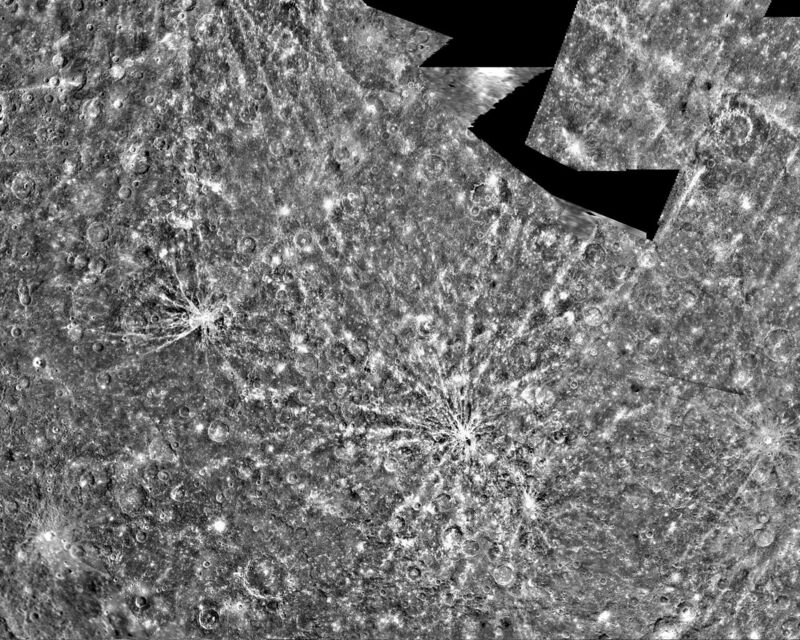 The Image Processing Lab at NASA's Jet Propulsion Laboratory produced this photomosaic using computer software and techniques developed for use in processing planetary data. 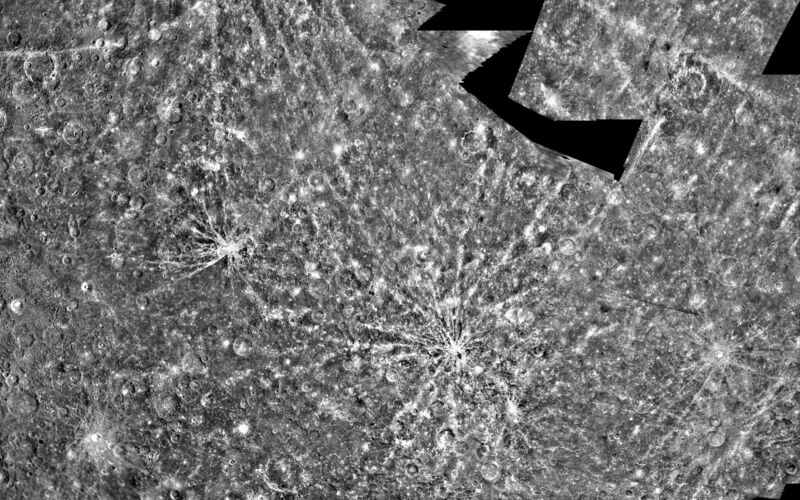 The images used to construct the Beethoven Quadrangle were taken as Mariner 10 flew passed Mercury. The Mariner 10 spacecraft was launched in 1974. The spacecraft took images of Venus in February 1974 on the way to three encounters with Mercury in March and September 1974 and March 1975. The spacecraft took more than 7,000 images of Mercury, Venus, the Earth and the Moon during its mission. The Mariner 10 Mission was managed by the Jet Propulsion Laboratory for NASA's Office of Space Science in Washington, D.C. This frame from an animation shows five versions of observations that NASA's Curiosity made about one hour apart while Mercury was passing in front of the sun on June 3, 2014. Two sunspots, each about the diameter of Earth, also appear. After passing on the darkside of the planet, NASA's Mariner 10 photographed the other, somewhat more illuminated hemisphere of Mercury. The north pole is at the top, two-thirds down from which is the equator. 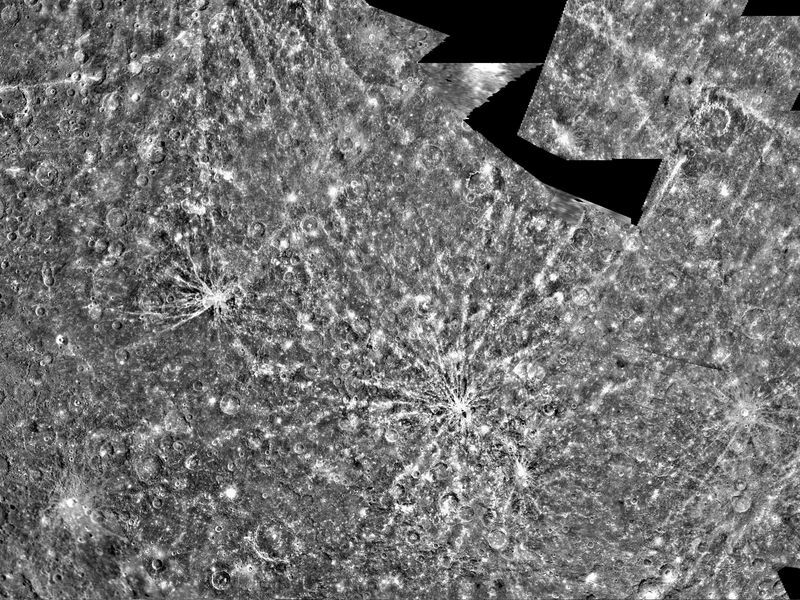 This computer generated photomosaic from NASA's Mariner 10 is of the southern half of Mercury's Shakespeare Quadrangle, named for the ancient Shakespeare crater located on the upper edge to the left of center.